Bedenkingen over de beoeffening der rechtsgeleerdheid, benevens vier verhandelingen over wysgeerige stoffen. Dordrecht, Abraham Blussé and son (colophon: printed by Johan Joseph Besseling, [Utrecht]), 1781. With: (2) PERRENOT, Abraham. Considérations sur l'étude de la jurisprudence, … Nouvelle edition. Berlin, G.J. Decker; Utrecht, Henrikus Spruit, 1776. 8vo. 2 works in 1 volume. 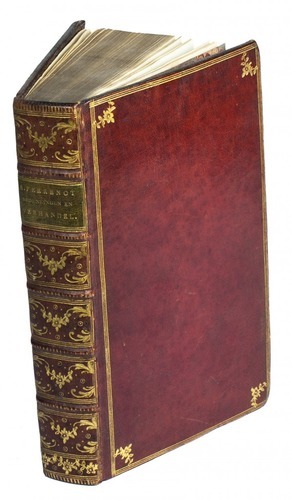 Contemporary red morocco, richly gold-tooled spine, gold-tooled boards (triple fillets, with floral ornaments in each corner), board edges and turn-ins, gilt edges. Bound by the Dutch court bookbinder Abraham van Rossum (active in Amsterdam 1812-1854), one of the "major binders" (Storm van Leeuwen) of that period. 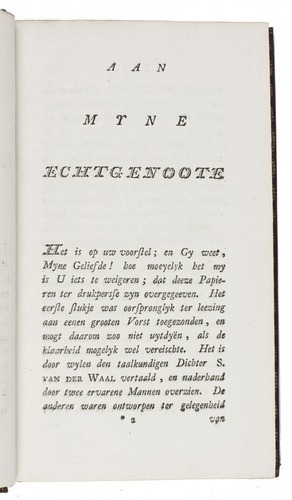 Rare first and only edition of the much expanded Dutch translation of a philosophical treatise for law students, on natural morality as the basis for all law, together with the second edition of the same treatise in the original French. The Monthly review (vol. 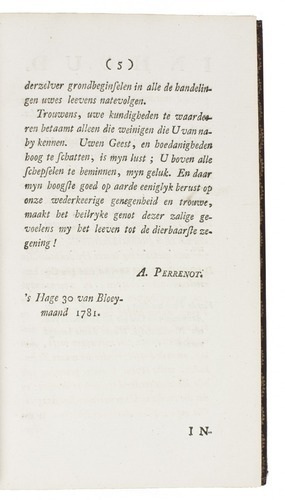 LII, 1775, p. 596) praises the author's "penetration, wit, and erudition" but on the other hand the original treatise "is one of those productions, which even an attentive reader totally forgets the very moment he has done perusing it". 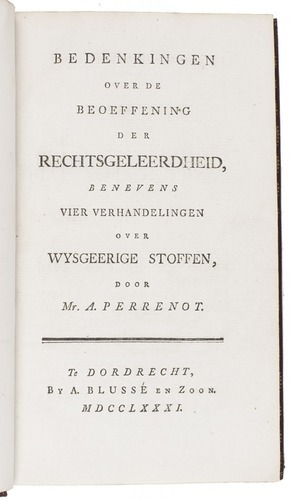 The Dutch translation is followed by four other philosophical treatises by the author, also concerning natural law, discussing the problems of divine law, moral obligations, moral sense, and the question whether the existence of God can be proved by reason. 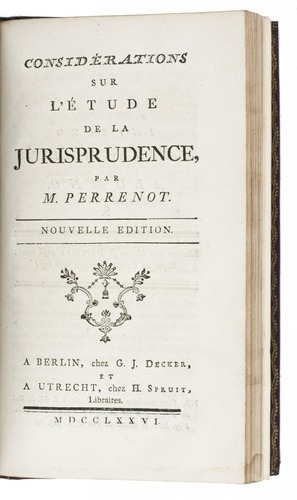 Abraham de Perrenot (1726-1784), was a Swiss lawyer of Huguenot-descent who worked as councillor for the Prince of Orange in the Netherlands. With the bookplate of Thomas Otho Travers (1785-1844), friend of Stamford Raffles. With some minor waterstain at the foot of the French treatise and the corners slightly bumped, otherwise in very good condition and well bound. Dekkers, Bibl. Belg. juridica, p. 133, no. 5; STCN (4 copies); WorldCat (6 copies, incl. 3 the same); ad 2: cf. Dekkers, p. 133, no. 4 (1779 ed. ); Quérard VII, p. 63 (1775 ed. ); for Perrenot: V.d. Aa XV, p. 205; for the binder: J. 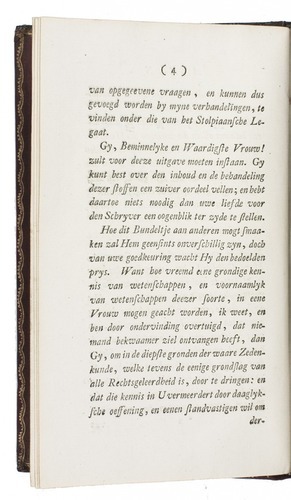 Storm van Leeuwen, “1725-1830 Bookbinding” on bibliopolis.nl.